The folks at Mortimer Snodgrass have some of the craziest sh*t you can find. Literally. 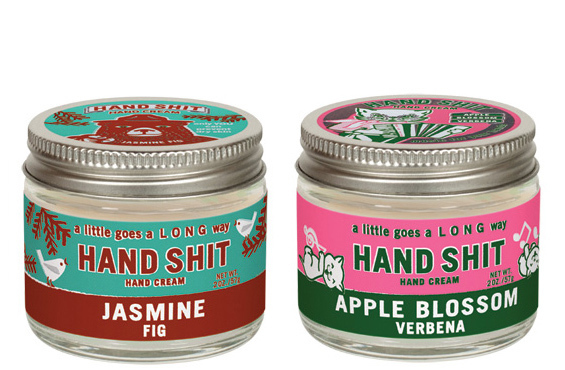 I recently tried their Hand Shhhh… (I have a hard time even saying the name of these hand creams) and it is divine. Made from beeswax, sunflower and coconut oils, they come in 4 unique and subtle scents: jasmine fig, honeysuckle sage, apple blossom verbena and the one I have – sweet pea lilac. Made in Massachusetts from mostly natural ingredients, you’ll love the fun designs of each little glass pot. I like to put mine on before I go to bed and then wake up with the softest hands. Thank goodness, they don’t smell like sh*t! Available at Mortimer Snodgrass online or at their fun gift store in Old Montreal for $14.